An adult, female red-necked wallaby (Macropus rufogriseus) carrying a joey presented with marked facial swelling on the right-hand side along with a corneal ulcer on the right eye. Numerous diagnostics were utilised in order to evaluate and identify the right maxillary second molar as demonstrating a radiolucent halo around the caudal root. This tooth was subsequently removed and the individual has gone on well to recover post-operatively. The normal dentition of the red-necked wallaby reflects that found across the marsupial family Macropodidae and consists of 3/1 incisors, 1-0/0 canines, 2/2 premolars and 4/4 molars . This similarity across the species is despite the wide variety in dietary preferences . Despite variations in grazing or browsing species, cinefluoroscopy has indentified independent hemi-jaw rotations that demonstrate similar jaw movement across the species . This is despite subtle but notable differences in browsing macropods demonstrating a more level molar row, versus the more curved molar row found attributed to grazing macropods [4,5]. Within this taxonomic group, dental lesions such as oral necrobacillosis are commonly recognised, but rarely reported, with lack of available data on identification and management of dental infections within these species [6,7]. 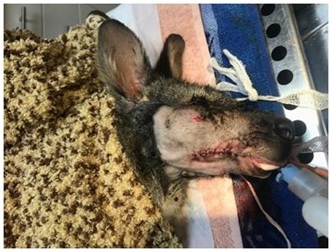 A 4-5 year old, female Red-Necked Wallaby (Macropus refogriseus) was presented with a one week history of a discrete, notably soft swelling on the right-hand side of her face, immediately below the right eye, with associated purulent right ocular discharge. The wallaby had been noticed to have a reduced appetite for one week prior to presentation. 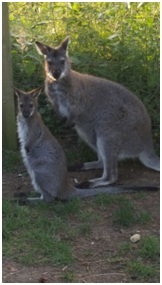 The wallaby had been seen by the private collection’s local veterinary surgeon initially, and a single intramuscular injection of oxytetracycline hydrochloride (Engemycin® 10% [DD] Solution for injection, Intervet International BV, Netherlands) was administered, at an unknown dose. This was given approximately two days after initial symptoms of facial swelling and ocular discharge was first noticed by the owner of the collection, the animal in question was then presented seven days after the initial clinical signs were recognised to ourselves. Although owned by a private collection with only a few animals, this individual was not easily handled without physical or chemical restraint. On initial presentation the wallaby underwent a limited physical exam due to the time travelled to the clinic and number of staff on hand at the time the animal was received. She was bright and alert, with a discrete soft tissue swelling ventral to the right eye, with associated marked palpebral conjunctivitis and purulent discharge. Based on the initial examination, topical treatment for the conjunctivitis was commenced using Chloramphenicol 1% w/v and ketorolac tromethamine (ACULAR® Ophthalmic Solution). Sub-cutaneuous non-steroidal anti-inflammatories were also given in the form of meloxicam (Loxicom® 20mg/ml, Norbrook Labatories, UK) at 0.5mg/kg body weight. The wallaby was then housed in a confined stable with heating and offered ad lib mixed feed and water pending a morning assessment. The morning following hospitalisation and initial support therapy, the wallaby was manually restrained for gaseous general anaethesia and further assessment. It has been remarked by the owner than state of pregnancy was not known with this individual, but that there was a possibility for there to be a joey present in the pouch. The adult wallaby was agreed to be the priority with regards to procedural risks. Manual restraint facilitated masking down for general anaesthesia, where the animal was induced using 5% isoflurane (IsoFlo® 100%, Norbrook Labatories) and 1.5L/min oxygen. Once an absence of corneal reflex and relaxing of jaw tone was noted, a rigid, 0 degree 4mm endoscope (Richards®) was used to aid in a full oral examination. The left maxillary first premolar was noted to be particularly loose, and was simply removed with digital manipulation. Nothing else on the oral examination appeared of concern via oroscopy. The swelling over the right-hand side of the face was identified as a likely abscess through palpation and aspiration, and as such was clipped, lanced using a size 21 scalpel blade and flushed with isotonic fluids (Vetivex 11 (Hartmann’s)®, Dechra Pharmaceuticals, PLC, UK). A central, superficial corneal ulcer measuring 4 x 4mm was identified in the right eye using topical fluorescein stain (Minims Fluorescein Sodium 1%, Bausch & Lomb UK Ltd.,). Topical chloramphenicol 1% treatment was commenced, applied four times daily, to the right eye. Upon this initial examination, it was confirmed that a young joey was being carried within the pouch. Following hospitalisation for 3 further days for assessment, the abscess under the right eye subsided and neovascularisation of the superficial corneal ulcer in the right eye was indicative of progressive healing. However, the wallaby was still demonstrating a reduced appetite. A further general anaesthetic was performed (utilising the same approach as the first) and a lateral radiograph was taken of the right upper arcade. The abscess that had appeared to re-fill after 3 days was re-flushed and the wallaby was started on oral enrofloxacin (Baytril®, Bayer) at a dose of 10mg/kg. A swab was taken for culture and sensitivity. 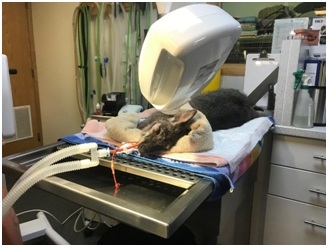 Eight days after initial presentation, due to recurrence, the option to transport the wallaby from the large animal department to a sister small animal referral practice with the availability of dental radiology was discussed and agreed with the owner. A further general anaesthetic wasadministered and the wallaby intubated to facilitate dental radiography. Multiple lateral and oblique views were taken (Figure 1), revealing a radiolucent halo around the caudal root of the right maxillary second molar (Figure 2). The molar was removed surgically, through a longitudinal incision over the affected molar (Figure 3). Absorbable suture was used so as not to require further handling for removal (Coated VICRYL® 2-0 (polyglactin 910), Ethicon) (Figure 4). Non-steroidal anti-inflammatories were administered in the form of meloxicom (Metacam®, Boehringer-Ingelheim) at a dose of 0.5mg/kg, administered as a sub-cutaneous injection. The joey was again assessed in the pouch and viability was confirmed. 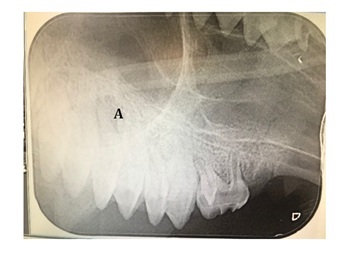 Following the surgical removal of the right upper maxillary second molar, antibiotic therapy was changed to oral potentiated amoxicillin, following the results of the swab culture reflecting a largely anaerobic growth. These were administered in the form of Synulox® Palatable Drops, Powder for Oral Suspension (Zoetis UK Ltd.,) at a dose rate of 12.5mg/kg, twice daily for seven days. By 5pm on the day of the operation to remove the affected tooth, the wallaby was eating more vigorously than had been during her entire period of hospitalisation; indicative of encouraging progress. The wallaby was then discharged two days following the operation. Due to the geographical distance the owners had travelled into the surgery, it was agreed that initial progress would be communicated over the telephone, unless further concern warranted a follow-up physical examination. Over the following months, the wallaby continued to do remarkably well with no further concerns from the owner. The joey that had been carried throughout the period of hospitalisation has also gone on to do very well, with no apparent detriments seen despite the delicate stage the individual was at the time of hospitalisation of the carrying mother (Figure 5). Despite a general lack of available data regarding dental pathology in these species [6,7], it is likely that the incidence in captive populations of macropods is higher than wild individuals . difficult to ascertain whether lesions in this species of this age are common-place, but a logical assumption can be made that owed to the lack of reported dental pathology within the literature regarding Macropodidae, this is not the case. Due to the potential for the joey present within the pouch to be thrown, a purse-string suture could have been placed to ensure retention of the joey, which is a method that would be adopted in further cases in the future . Although a maxillary nerve block would have been beneficial for multimodal anaesthesia, its potential for adversely affecting the joey was unknown. However, a very recent article published by Rodrigo-Mocholi, et al., describes the use of a maxillary nerve bock in a lactating red-necked wallaby, without adverse effects being observed to either the wallaby or joey present within the pouch . An alternative to oral or injectable medication would have been the possibility for placement of antibiotic-impregnated polymethylmethacrylate beads. The use of these in a red-necked wallaby has been described by Hartley, et al., and could have provided an appropriate alternative to more frequent stressful handling associated with other methods, such as administration of injectables . This case presented a particular challenge, as not only is literature regarding dental pathology in these species lacking, but the animal in question was carrying young; the outcome of which when subjected to the physiological stress of the dam being caught for examination, as well as multiple anaesthetics and medical management remained unknown. It has been encouraging to follow the case since surgery and observe the joey continue to develop and exit the pouch at the expected 7-8 months of age . Kirkpatrick TH (1969) The dentition of the marsupial family Macropodidae: With particular reference to tooth development in the grey kangaroo Macropus giganteus. PhD Thesis, School of Biological Sciences, The University of Queensland. Austraila. Warburton NM (2009) Comparative jaw muscle anatomy in kangaroos, wallabies and rat-kangaroos (Marsupialia: Macropodoidea). Anat Rec (Hoboken) 292: 875-884. Lentle RG, Hume ID, Stafford KJ, Kennedy M, Haslett S, at al. (2003) Comparison of tooth morphology and wear patterns in four species of wallabies. Australian Journal of Zoology 51: 61-79. Fowler ME, Miller RE (2003) Zoo and Wild Animal Medicine (5thedn). W B Saunders, Pennsylvania, USA, Pg no: 289. Sanson G (1989) Morphological adaptations of teeth to diets and feeding in the Macropodoidea in kangaroos wallabies rat-kangaroos. Grigg G, Jarman P, Hume I (eds.). Surrey Beatty and Sons Pty Ltd., Chipping Norton, Australia, 1: 162-165. Borland D, Coulson G, Beveridge I (2011) Oral necrobacillosis (‘lumpy jaw’) in a free-ranging population of eastern grey kangaroos (Macropus giganteus) in Victoria. Australian Mammology 34: 29-35. Kilgallon CP, Bicknese B, Fagan DA (2010) Successful treatment of chronic periapical osteomyelitis in a Parma Wallaby(Marcopus parma)using comprehensive endodontic therapy with apicoectomy. J Zoo Wildl Med 41: 703-709. Vogelnest L, Portas T (2006) Macropods in medicine of Australian mammals. Vogelnest L, Woods R (eds.). CSIRO Publishing, Clayton, Australia, Pg no: 170. Schultz DJ, Whitehead PJ, Taggart DA (2006) Review of surrogacy program for endangered Victorian brush-tailed rock wallaby (Petrogale penicillate) with special reference to animal husbandry and veterinary considerations. J Zoo Wildl Med 37: 33-39. 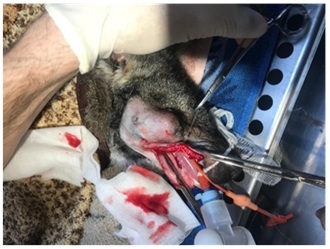 Rodrigo-Mocholi D, Vlaminck L, Gasthuys F, Schauvliege S (2018) Maxillary nerve block as part of a multimodal anaesthesia in a lactating red-necked wallaby (Macropus rufogriseus) undergoing partial maxillectomy. Record Case Reports 6: 456. Hartley MP, Sanderson S (2008) Use of antibiotic impregnated polymethylmethacrylate beads for the treatment of chronic mandibular osteomyelitis in a Bennett’s wallaby (Macropus rufo-griseus rufogriseus). Aust Vet J 81: 742-744. Johnson-Delaney CA, Lennox AM (2017) Reproductive disorders of marsupials. Vet Clin North Am Exot Anim Pract 20: 539-553. Figure 1: Oblique dental x-ray view. Figure 2: Radiographic view of radiolucent halo surrounding root of right maxillary second molar (A). Figure 3: Longitudinal incision to facilitate access to the affected molar. Figure 5: Wallaby with joey 6 months after surgery. Citation: Simpson EL (2018) Diagnostic Approach and Surgical Management of a Maxillary Molar Tooth Root Infection in a Red-Necked Wallaby (Macropus rufogriseus) Carrying a Joey. Archiv Zool Stud 1: 006. Copyright: © 2018 Simpson EL. This is an open-access article distributed under the terms of the Creative Commons Attribution License, which permits unrestricted use, distribution, and reproduction in any medium, provided the original author and source are credited.